Product #5842 | SKU D40 | 0.0 (no ratings yet) Thanks for your rating! 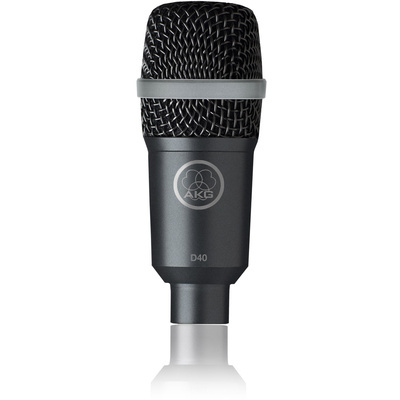 The AKG D40 Cardioid Instrument Microphone is a rugged, road-worthy solution for capturing drums, percussion, guitar amplifiers, keyboard amplifiers and wind instruments in recording or live sound reinforcement applications. The D40 features a cardioid polar pattern which is effective in minimising off-axis feedback and noise by providing a focused pickup pattern. The patented AKG Varimotion diaphragm enhances audio quality and results in pristine audio reproduction. The all metal construction and steel-mesh grille make the D40 rugged and able to withstand the rigours of life on the road. An integrated stand adapter and standard H 440 mounting bracket are included for mounting onto snare drums, tom-toms, etc. The D40 features a cardioid polar pattern which is effective in minimising off-axis feedback and noise by providing a focused pickup pattern. The patented AKG Varimotion diaphragm enhances audio quality and results in pristine audio reproduction. The all metal construction and steel-mesh grille make the D40 rugged and able to withstand the rigours of life on the road.